Once again, the country’s youth has spoken. Talking Points Memo recently published an article declaring voters between the ages of 18 and 29 were a “huge part of the President’s coalition.” 19 percent of voters in this year’s election comprised this demographic, an age group that proved — for the second time in a row — that they back Barack. U.S. News even went so far as to say that Obama wouldn’t have won the election if it wasn’t for the young vote. 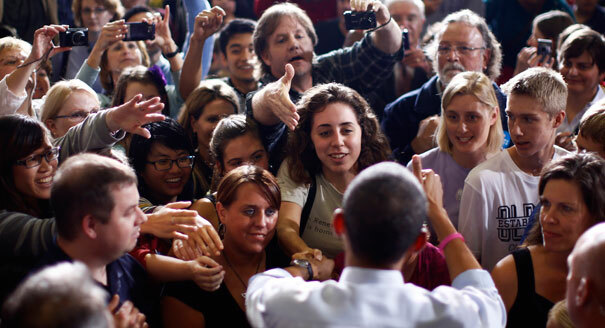 Polls show that Obama won the group by margins as large as 25 points over Romney in the election’s big states, Ohio, Virginia, Florida and Pennsylvania and official exit polls show the Prez captured 60 percent of the youth vote to Romney’s 36 percent. So does all this mean there’s hope for the political future of our youth? Or that we young people are becoming increasingly more invested in our country’s politics and policies? For fear of sounding too much like a Negative Nancy, I do believe that this generation is much more well-informed about their candidates of choice than previous age groups who didn’t have the advantages of the Internet. However, I think whole campaign surrounding Obama is cleverly targeted toward the nation’s youth. Let’s take Obama’s circle of friends. He counts Jay-Z and Beyonce as two close friends, who both performed at his memorable rock show inauguration in 2008. He has also been photographed at countless soirees with the likes of Will Smith and Jada Pinket-Smith, and counts Oprah as a dear friend. These aforementioned individuals are some of the most powerful celebrities in the industry, and hold a lot of clout with the current generation. Countless celebs have been photographed sporting a myriad of Obama paraphernalia (Katy Perry’s very “Forward” dress anyone?) and have been more than outspoken in support of the President. So is it fair to say the Obama administration is built and supported on a solid foundation of young voters, uber-celebrities, and the under-represented and disenfranchised Americans?